I was watching GMA the other day and they did a study that showed that only children are more likely to want to have a million kids because of their own lonely childhoods...oh no. That must mean Josh and I are next on the list for a reality television show about our thirty kids. I asked Josh if he had the urge to have 16 kids, and he said no. Thank God. Trust me, I won't be the next Octamom. Speaking of the Octomom.. When they very first released her picture, the first thing I said to my friend Chris (because we also check out the newest celeb gossip together) was "wow, she looks a lot like Angelina Jolie". Fast forward to the article I read today. 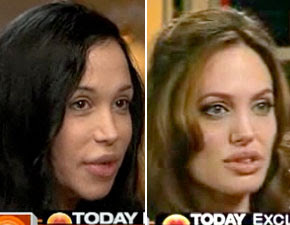 Octuplet Mom Denies She's Trying to be like Angelina Jolie. Whatever. Ok, so it's not really trying to be her to have 14 children...but it is when you get a nose job and get your lips injected and look enough like her for the whole world to realize that you want to be her. I mean really. She even tried to say that she hadn't ever had plastic surgery. I mean, I'm just from Indiana and all, and I may not be able to spot a lot of plastic work, but that's about as obvious as Rod Blagojevich. Don't believe me, judge for yourself. I'll get off of my soapbox now. lol.. I was thinking the same thing about her and Jolie when I saw her on TV.. I couldn't even watch the segment because I just think it was down right RETARDED. And as for that doc.. What was he thinking?!?!?! Idiot.